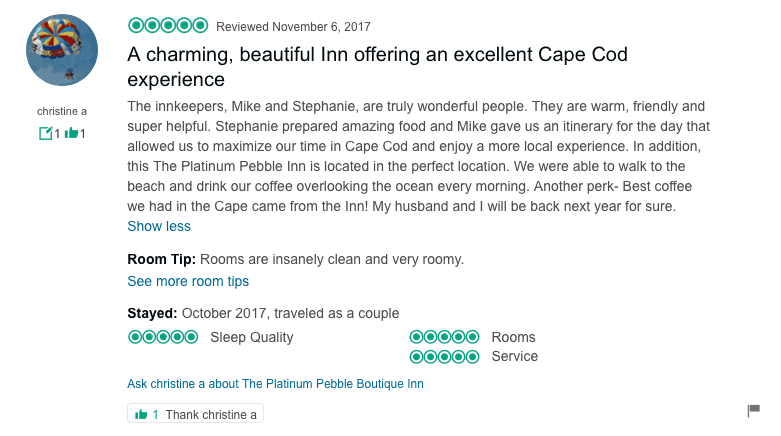 The innkeepers, Mike and Stephanie, are truly wonderful people. They are warm, friendly and super helpful. Stephanie prepared amazing food and Mike gave us an itinerary for the day that allowed us to maximize our time in Cape Cod and enjoy a more local experience. 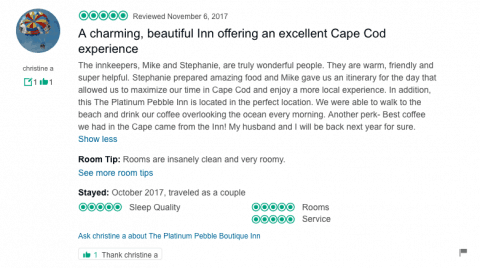 In addition, this The Platinum Pebble Inn is located in the perfect location. We were able to walk to the beach and drink our coffee overlooking the ocean every morning. Another perk- Best coffee we had in the Cape came from the Inn! My husband and I will be back next year for sure.